People interested in having input into how the single family homes will look in Phase 2 of the Allied Drive redevelopment will want to attend the listening session this Wednesday, June 30, at the Boys & Girls Club. See the calendar, article #1, and attachment #1. Wed., June 30, 2010, 5:00-6:30 p.m. – Listening Session on Phase 2 Allied Drive Redevelopment, Single Family Houses. Boys & Girls Club, 4619 Jenewein Rd. Tuesday, June 20, 7 p.m. – DMNA Council. Prairie UU Society, corner of Crawford and Whenona. Any resident may attend, but only Council members may vote. 8 - What Should Go into Fitchburg Public Library Collection? Phase 2 plans for Allied Drive redevelopment call for single family houses on the lower end of Allied. This area has stood vacant for many months after having been cleared of apartments some time back. How do you think the single family homes should look? To have your say, attend the Listening Session at the Boys and Girls Club, Wednesday, June 30, 5:00 - 6:30 p.m. Melissa Destree of Destree Design Architects and staff of the Community Development Authority (CDA) will be at this meeting to hear what people have to say. Bring your neighbors! To see a small map of the entire area for redevelopment, click on the attachment. An impression of the Dunn’s Marsh Neighborhood begins at its borders, primarily the frontage roads and Seminole Highway. Due to litter and trash, this impression is often poor at best although not at all representative of the residential part of the neighborhood. Responding to ongoing concerns about the trash and litter along the frontage roads in our neighborhood, at its June meeting the DMNA Neighborhood Council authorized a program to clean up the litter on a monthly basis and to enlist neighborhood businesses in regular pick up around their premises. The program will use “trash pick up brigades” to scour the worst areas on a monthly basis. Neighborhood Association representatives will also personally contact the frontage road businesses to inform them of our concerns and ask them to regularly remove litter and debris that accumulates on their property and across the frontage road from their premises. Contact Neighborhood Preservation Convenor Gigi Miller Solari for more information or to volunteer to be part of the team that will visit the businesses or become a member of a trash pick up brigade. Her contact information is 712-1408 or millerg@firstweber.com. 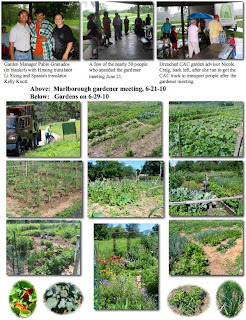 After being hit with an 11-item citation from the city of Madison regarding maintenance issues, gardeners in the Marlborough Park community garden met on June 21 to talk about the complaints that had resulted in the citation. Then on their Saturday, June 26, workday, they removed several piles of wood debris and accomplished other tasks. The Community Action Coalition (CAC) which holds the lease, had already addressed several of the issues prior to the meeting. These are some of the things that have been done. The door has been put back on one of the sheds. The area around the sheds has been cleaned up including the garden compost heap behind the sheds. Volunteers were secured for putting full garbage bags out by the bike path for collection by the city on a regular basis. Gardeners were also reminded of their responsibilities for keeping the garden area looking neat. Garbage should not be left lying around. Community tools should be returned to the shed and, if broken, should never be thrown into the grass or the paths. Rather than discarding piles of weeds anywhere outside the garden, they should either be kept in the gardener’s own plot or taken to the central compost area near the sheds. Some policies were reviewed relating to watering. Hoses that cross the main central path should never be left there after use since this prevents mowing of that path. The water should be turned off when a gardener is finished using it unless another gardener is watering from the same hydrant. Kids should be taught not to play with the water or to throw sand out of the sandbox. The gardeners also addressed the issue of several piles of stakes and other waste wood, most of which was removed on Saturday. Gardeners agreed that each spring any stakes or other garden items stored by the sheds or in other areas during the fall cleanup could be used by gardeners on a first-come, first-served basis, thus preventing accumulation. 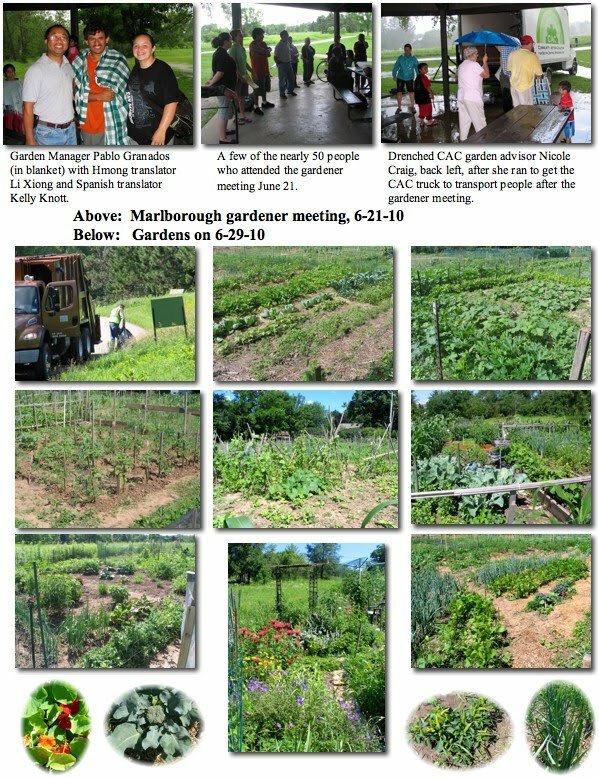 Gardeners meeting at 7 p.m. on June 21 got a good dousing even though the meeting was held in Marlborough Park shelter. Partway through the meeting, Madison was hit by a cloudburst that lasted about 45 minutes. (This was the rain that flooded University Avenue up to car headlight depth.) The gusting wind blew the heavy rain at least halfway into the shelter, pushing the nearly 50 people together into the center and to the south edge, but still most got soaked. Kids tended to run out into the rain just to feel the pounding drops. At the end, when the downpour let up, water was coursing through the park like a river, flowing inches deep down the bike path that runs along the east side and pouring into – and out of - the rain garden near the basketball court. A neighborhood rain gauge registered 2.4 inches of rain! Despite the rain, everyone left in a good humor. Salary Increase: I voted against increasing the salaries of the Sheriff, Clerk of Court, and Coroner. The proposal was an increase of 3% per year for the next four years. I felt, that given our economy, it was not fiscally responsible to raise the salaries of some of our already highest paid employees. However, the proposed salary increases did pass the full county board. 911 Calls: Updates to the 911 center are completed, and changes have made a tremendous increase in the quantity and quality of time spent with callers. I want to clarify a misleading article from the newspaper last May. It stated that 911 callers could be put on hold. That is completely incorrect! NO ONE is ever put on hold. A new recording tells you to remain on the line and not hang up if your call is not answered within 4 rings. This recording is rarely used, as more than 96% of calls are answered within 3 rings (which is an exemplary response time, above national standards). But we were concerned that in the few times calls did take longer to answer, callers sometimes hung up. With the new recording, we hope to reassure those waiting. Also, we began rerouting calls to the non-emergency line (those not dialing 911) away from the 911 center, freeing up 911 dispatchers to focus on emergency calls only. This change has already had a huge impact on the 911 center, as the center receives more than 1,000 calls a month for non-emergency information. So now, even more emergency call operators are available. Racial Disparities Task Force: This task force completed its comprehensive review of all facets of the criminal justice system, to help problem solve why Dane County has one of the worst racial disparities incarceration rates in the nation. I was a lead sponsor of endorsing the final report and creating an implementation team to follow-through with the task force recommendations. I look forward to working with the implementation team closely to tackle this huge and complex problem. Overtime Subcommittee: I was appointed to a subcommittee investigating county overtime costs. We reviewed our four 24-hour departments: the Sheriff’s Department, the 911 Center, the Badger Prairie Nursing Home, and the Highway Department. Given the 24-hour needs of these departments, some overtime work is inevitable. However, we want to ensure that processes are in place to reduce overtime whenever possible. Our subcommittee concluded that the sheriff's department and the 911 center had several initiatives in place to monitor and reduce overtime costs, including most recently the funding for "prehires" in the departments so that there are reduced vacancies at any given time due to retirement or promotions. Our greatest concern was with the Highway Department. It does not have individuals assigned to after-hours shifts, meaning that anytime there is a snowstorm or road repair that requires work after 5pm, we are automatically paying overtime. That struck me as very shortsighted given that, every year, there are hundreds of work hours performed after 5pm. The subcommittee forwarded this concern to the county board committee that oversees the Highway Department, and we expect changes in the coming budget. Med Drop: The semi-annual med drop on June 5th was a huge success. In just one day, more than 5,000 pounds of medicines were collected at the three sites around the county. (Compared to 10,000 pounds collected cumulatively over the prior of 4 years!) This is such an important program—keeping expired drugs out of medicine cabinets and away from those who would abuse them, while giving people an option to dispose of them without flushing them down the toilet (and into our water) or throwing them away (where they seep into our soil). I am working to fund permanent drop-off sites, one of the ultimate goals of the program. Improving our Lakes: Smelly, dirty, Madison lakes seem to be a problem every summer. The county is taking affirmative steps to clean up our waterways. We approved the construction of a community manure digester in Dane County. The digester will remove phosphorus from the manure (phosphorus being the greatest cause of pollution in area lakes), reducing run off into the lake. The project will also generate approximately $2 million dollars worth of electricity each year, and it will create approximately 25 construction jobs and approximately 10 permanent operational jobs. Additionally, the county’s annual “Take a Stake in the Lakes” clean-up event was a success, where hundreds of people came out to Lake Wingra, Lake Monona, and Lake Waubesa to clean the shorelines, haul weeds, mark storm drains, and more. The county has extensive programs to improve the status of our lakes. Find out more at www.myfairlakes.com. Verona Road/ Beltline Construction: I continue to talk and work with neighborhood leaders and the state department of transportation to address concerns with this project, including increased truck traffic, noise and air pollution, and the creation of a new frontage road that will tremendously impact neighborhood residents and reduce neighborhood greenspace. It’s a bargain – all the summer bus rides a kid might ever need or want for just $30. The Summer Youth Pass is valid June 12 through September 8 for unlimited rides for youths 5 -17 or still in high school during the Madison Metropolitan School District summer break. · Metro Sales Outlets. There are many outlets. Some are PLS Check Cashing at 2010 Red Arrow Trail, the Copps food stores, Mallat Pharmacy at 3506 Monroe Street, Stop-N-Shop at 501 State St., University Book Store, at 711 State St., and the Madison Dept. of Transportation in the Madison Municipal Building. Starting in July, Madison Metro’'s customer service phone center will expand its hours on both Sundays and holidays. Starting Sunday, July 4, the customer service center will be open on Sundays and holidays from 9 AM through 4:30 PM. Metro will continue to be open on weekdays from 6:15 AM - 6:00 PM and Saturdays from 8:00 AM - 4:30 PM. The Fitchburg Public Library is starting to build the library collection for opening day. We invite your suggestions for materials to include in the library collection. There is a form on the library web site (http://www.city.fitchburg.wi.us/library/odcForm.php <http://www.city.fitchburg.wi.us/library/odcForm.php> ) you can fill out to indicate subject areas, types of materials and specific titles of books and magazines. Suggestions also can be emailed directly to the library at library@city.fitchburg.wi.us. If you are like most gardeners, when your produce comes in, it comes in with a vengeance: pails of cucumbers, green beans galore, zucchini run rampant, Swiss chard and kale to the nth degree. You’re drowning in veggies, but you don’t want to waste them. What to do? Here’s one answer. Community Action Coalition of South Central Wisconsin (CAC) is piloting the “neighborhood Challenge-Plant a Row for the Hungry” to collect extra produce from home gardeners for distribution to food pantries. To get this working in our neighborhood, a volunteer from the DMNA or ADMNAwould need to come forward to be the “neighborhood association representative (NAR).” The NAR would be in charge of organizing the collection process which might involve other volunteers as well as home gardeners who make the donations. Welcome to the 3rd Annual Pedal for the House Charity Bike Ride (Formerly the Ronald McDonald House Charity Bike Ride) scheduled for Saturday, August 21. The bike ride benefits the Ronald McDonald House Charities of Madison. These charities are dedicated to improving children’s access to the highest quality health care. Pedal For The House is a one-day cycling event that starts and ends at Tollefson Park, Verona, WI. Four varying routes that have something for everyone. The family-friendly 10-mile route is a great for most ages and abilities. There is a hill or two that will definitely get your heart pumping! A Fun Loop winds around the park and is ideal for walkers, strollers, wheelchairs, tricycles and anyone who wants the ultimate Fun Loop! New this year, is a 20-mile route. Please don't let the shorter distance fool you...this route is quite hilly! The 40 and 60-mile routes are for the avid cyclists who REALLY enjoy a challenge and some pretty good climbs. While these routes are very beautiful they are also very challenging. A post-ride meal after the event is offered for the all participants, riders and volunteers. There will be children's entertainment at the park for our smaller riders and those who are relaxing. This includes a bounce house, face painter and an art/crafts table. Two free educational seminars will be presented at HospiceCare Inc. in Madison during July. On Tuesday, July 13, from 6:30 p.m. to 8:00 p.m., HospiceCare will offer “Spiritual Needs and Questions at the End of Life.” On Monday, July 19, from 1:00 p.m. to 2:00 p.m., HospiceCare will offer “Choosing the Gift of HospiceCare,” a presentation about the support that’s available for people with life-limiting conditions, and their caregivers. Both seminars are free, open to the public and will take place at the Don & Marilyn Anderson HospiceCare Center, 5395 E. Cheryl Parkway, Madison. Pre-registration is requested; please call Carrie Glantz, HospiceCare public affairs, at (608) 327-7202. In July, HospiceCare Inc. will begin a grief support group series and offer two recurring support groups for those grieving the death of a loved one. HospiceCare will also offer an informational seminar for caregivers. All groups are open to the public and free of charge. All groups require pre-registration and are held at the Don & Marilyn Anderson HospiceCare Center, 5395 E. Cheryl Parkway, Madison, unless otherwise noted. To register, call HospiceCare at (608) 276-4660 and ask to speak with a grief counselor. · Saturday Morning Kids Grief Group will be held Saturday, July 24, from 9:00 a.m. to 11:00 a.m.
· Bridges Weekly Support Group is held every Wednesday, from 9:30 a.m. to 11:00 a.m. Pre-registration is not required. · Introduction to Grief will be held Wednesday, July 7, from 6:30 p.m. to 7:30 p.m.
· Balancing Elder Care and Work will be held Tuesday, from July 20, 6:30 p.m. to 8:00 p.m. This seminar is for those caring for someone with a progressive or terminal illness. Several changes have occurred on the Dunn’s Marsh Neighborhood Council since the elections in October. It also contains phone numbers for local elected officials and non-emergency police numbers. You might want to print out the updated chart. The Council currently has 2 vacancies. Any resident who wants to apply to serve on the Council may provide information to DMNA president Jeff Glazer. Besides giving your name and contact information, facts about your interests and qualifications are important. The main qualifications are interest in working for the neighborhood in a positive way and ability to attend meetings.